Here are another two poems by Saigyo. During his lifetime, the political situation gradually deteriorated until the most awful civil war broke out between the Taira and the Minamoto factions. Saigyo had himself been a warrior in his youth and had become part of an imperial guard troop. In Saigyo's mind, war and hell were similar phenomena and like most medieval people he believed that those who engaged in one were likely to also find themselves engaged in the other. Saigyo turned from being a soldier (who delighted in a good sword) to being a monk, but still worried what would be his fate in the end. Nowadays we have even more fearsome weapons. Here is a poem by Saigyo (1118-1190), one of Japan's greatest poets, also reckoned a saint. He was an independent Buddhist practitioner who spent much time travelling or in retreat, often at Mount Koya, the centre of Shingon Buddhism and later near to the Ise Shrine. He believed in honji-suijaku, the idea that the Shinto Gods were manifestations of celestial Buddhas, the supreme Goddess Amaterasu being a form of Vairochana Buddha, and so on. He came from a samurai family and initially trained as a warrior but became disenchanted with court life with all its hypocrisy and double dealing. One thread running through his life was his inner struggle with the karma of his earlier life before he became a monk. Another was his observation of the steady degeneration of Japanese society into civil war during his lifetime. His exquisite poetry reveals sensitivity to people in all ranks of society, a fair amount of irony in his social comment, modest self-reflection, and a strong sense of the identity of Buddhism and nature. my journey in the midst of sky. Here Saigyo is telling us literally about one of his many stays alone in the mountains, passing the winter in retreat in a hut. At the same time he is telling us about his inner struggle to know what is right and where to go, what to do with his life. The poem manages to suggest two completely different extremes all at once - a person directionless and lost and a person living the ideal life of complete nonattachment, as free as a cloud in the sky. We can imagine that Saigyo passed much of his life poised on this cusp. Many people tend to think that when a person is enlightened, they have no more uncertainties, no more worries or loneliness, that they are happy all the time and have the answer to everything. When one is a Buddhist teacher one can be surprised to find that others are projecting such an image upon one. Saigyo, however, illustrates a rather different way of illumination - a path that is at once rigorous yet totally human. Few are those whose contribution to humanity — be it art, or music, or literature, or some other enchantment — fills the heart with uncontainable gratitude for their very existence. Mary Oliver — one of the greatest poets of all time, and perhaps the greatest of our time — is one such blessing of a writer. She, the patron saint of paying compassionate attention, has made a supreme art of bearing witness to our world — be it in her exquisite poems, or in the prose of that moving remembrance of her soul mate, or in her meditations on the craft of poetry itself. In her immensely rewarding recent On Being conversation with Krista Tippett — triply magical because Oliver rarely gives interviews, and never ones this dimensional and revealing — she read several of her most beloved poems. 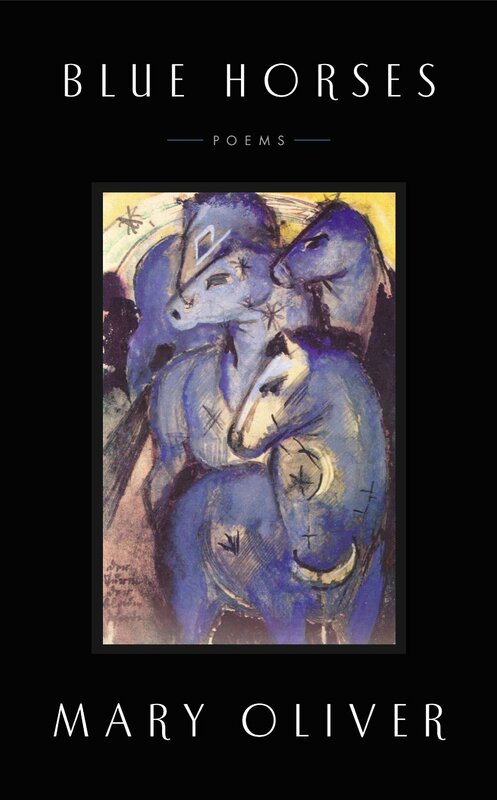 While “Wild Geese” remains a favorite, I was especially taken with a four-part poem titled “The Fourth Sign of the Zodiac,” found in Oliver’s sublime 2014 collection Blue Horses: Poems (public library). It is partly a bow to her recent triumph over cancer, and partly a score to the larger tango of life and death which we all, wittingly or not, are summoned to dance daily. Like so much of her work, it is an uncommonly direct yet beguiling love letter to vitality itself, poured from the soul of someone utterly besotted with this world which we too are invited to embrace.